Here is a group of questions we hear often. 1Do I need to schedule an appointment for service or diagnosis for my vehicle? Yes. We always recommend that you call for an appointment or submit an appointment request using our online appointment form. A routine service should only take 45 minutes while you wait. We also understand vehicles don’t break by appointment and we will always do our best to accommodate you. 2What does it mean if my "check engine" or "service engine soon" light comes on? There are many sensors, solenoids and computers that manage your vehicle’s engine and transmission performance. When a problem is detected by the vehicle the “check engine” light may be illuminated. Although your car may seem to run fine, it is important to have the issue addressed to prevent long-term problems. 3Do you accept extended warranties? Yes. We accept most extended warranties. Please bring your warranty information with you when you come in and we will be happy to contact them for you. 4How often should I service my transmission? We recommend based off of experience that you service your automatic transmission every 15,000 to 20,000 miles or as recommended by the manufacturer. Please call if you have any questions regarding our transmission services. 5How often should I service my engine oil? We recommend that you get your engine oil changed every 3000 miles or as recommended by the manufacture. 6Do you do more than transmissions? Yes, we do. With the exception of smog tests, tires & alignments, we do all types of repair and we are proud to say that we are an AAA auto repair facility. 7Is it necessary to flush my transmission? This is a question we receive quite often. With a properly maintained transmission, there should never be a need to flush your transmission. Only under rare and extreme circumstances do we find it necessary to flush your transmission. 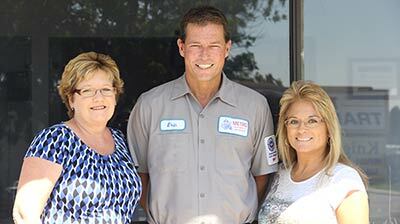 The team at Metro Transmission Inc. is always here to help. If you have any additional questions, please feel free to give us a call at (760) 471-0223 Monday through Friday 7:00AM to 5:30PM. We look forward to hearing from you!